The cake part is a bit dry. Usethis cake recipe instead. The Dutchess bake shop in Edmonton is very popular for their pastries and cake. This cake called " The Duke Cake" is adapted from their cookbook. The recipe has been modified to fit a 9-inch cake pan. The conversion I found on the internet worked really well. (radius) want to use divide it by recipe pan (ex. (4.5 x 4.5) ÷ (4 x 4) = 20.25/16 = 1.2656 use this number to multiply your ingredients. Make sure you have a scale to make this cake. Lots of steps to make this cake. I've only made it once. Heat sugar in pan until golden brown do not stir, heat whipping cream in microwave until scalding, then pour cream into sugar in increments with stirring. Sugar may crystalized out, so you can strain it if needed. Remove from heat, mix in butter, flour and salt. Let it cool and refrigerate until set. Good for two weeks in fridge. Combine (3) in mixer bowl, add the melted chocolate (1) then add the dry ingredients (2) in increments, do not overmix. 7) 238 g unsalted butter, cubbed, room temp. Pour mixture into the mixer bowl and cool to room temperature. Once cooled whip in the butter until fully incorporated. 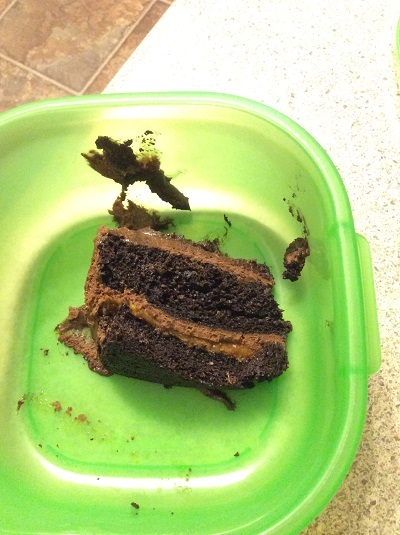 Cut cake in half, spread a layer of salted caramel onto the bottom half and top with frosting then cake. Frost the entire cake all around and freeze it. Save some frosting for piping at room temperature. Had too much waste. Maybe make half the recipe below. Combine (9) in saucepan and heat until scalding, then add into chocolate (8) in 3 portions. Pour mixture onto the cake, cover entirely with glace. Use reserved frosting to decorate.